...so sweet! seriously... it's the season of delicious, fresh, and fragrant produce. i have never been able to walk away from a farmers' market or roadside stand without sampling and buying something tasty for my next meal. one of the best part of summer is the non-stop parade of delicious fruit in season... from the first strawberries of late spring to the apples still ripening in the orchard. as much as i enjoy the challenge of gorging on fresh cherries, plums, and concord grapes by the bowlful... there comes a point where even the most discerning consumer of freshness finds salvation in, of all places... the freezer. it seems strange then to be turning to frozen fruit for a celebration of all things summery, but trust me.... it works! if, like me, you prefer to purchase fruit and vegetables in season (a major aspect of the buy-local philosophy), the freezer is your best friend for extending the life of produce at peak freshness. i also admit to being a bit frugal when it comes to... well... most things, and buying some items when the market is flooded is a great way to defer future cost. the first strawberries of spring were a bit too pricey to grab more than a pint or quart at a time, but summer strawberries are an absolute steal. like most summer fruits, they freeze incredibly well. trim the tops, freeze in a single-layer on a cookie sheet or any flat thing that won't crack or break, then pop into a "freezer" bag, and you have incredible berries well beyond the growing season. i keep frozen pineapple on hand for potential emergencies... cause you never know when you need to make a pineapple-coconut-passionfruit smoothie at 3 in the morning. what... am i the only one? 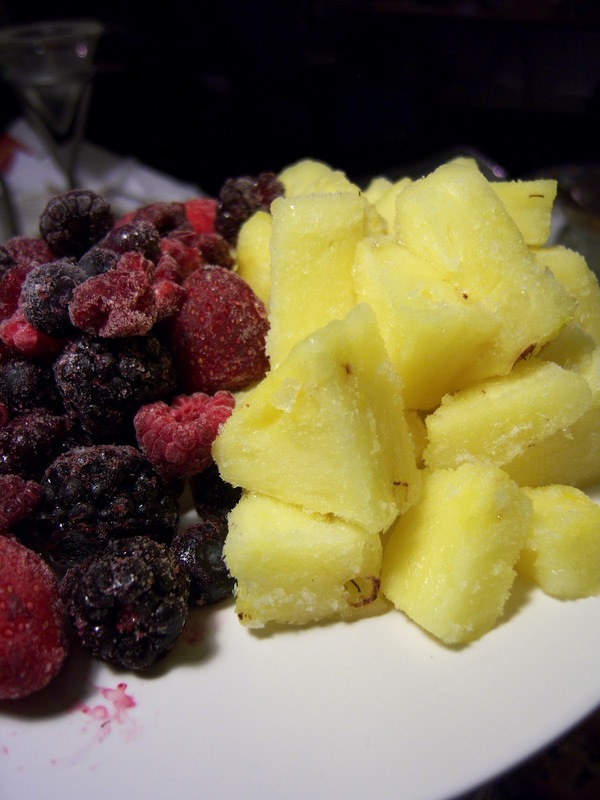 smoothie-ready melange of berries (left) and pineapple chunks (right). 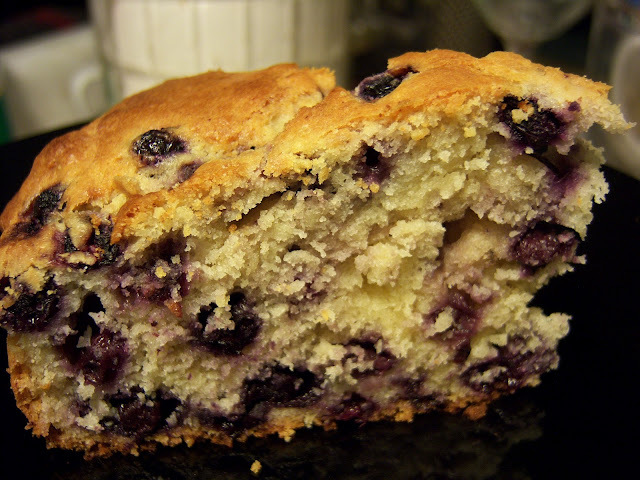 one really practical use for frozen berries is in baking. if you've ever tried to make a muffin or waffle batter with fresh berries, you will know why frozen is the way to go... unless you really were aiming for puree of raspberry muffins. 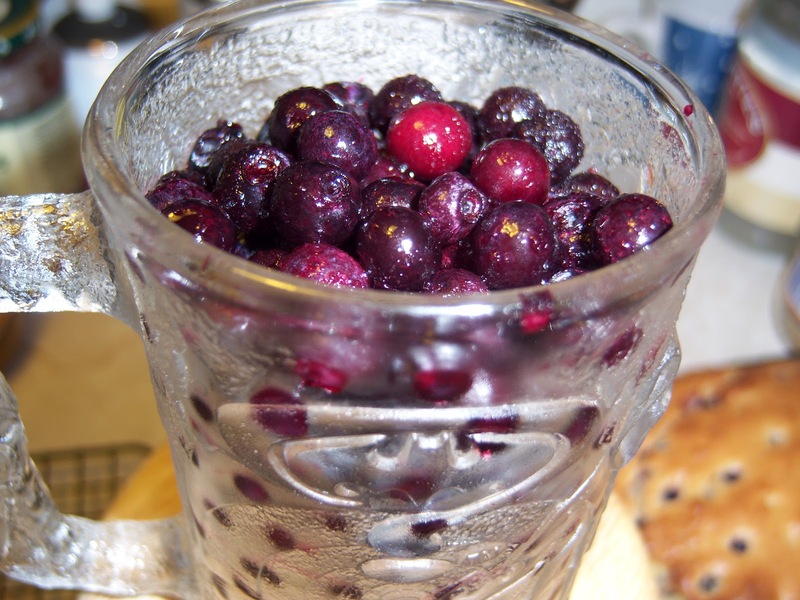 i recently found myself in possession of some frozen wild blueberries, which i took as a sign from the cosmos to work on my blueberry muffin recipe... so here goes. Batman® cup of frozen, wild blueberries. and, yes... it is an internationally-recognized unit of measurement. preheat the oven to 375° F. in a separate container, combine the flour, baking powder, salt, nutmeg, and black pepper. the freshly-ground black pepper adds a certain je ne sais quoi to the muffin... noticeable only as a slight tingle on the tongue... but it is totally optional. grate the zest of the whole lemon and add to the flour mixture. in a large mixing bowl, beat together the margarine and sugar until light and fluffy, then incorporate the eggs and beat well to combine. squeeze the juice of the previously-zested lemon into a measuring cup (watch out for seeds) then add cream or half-and-half up to the 1/2 cup mark. you are intentionally curdling or "souring" the milk with the lemon juice. add the soured-cream to the egg mixture and mix thoroughly. add the vanilla and almond (optional) extract. 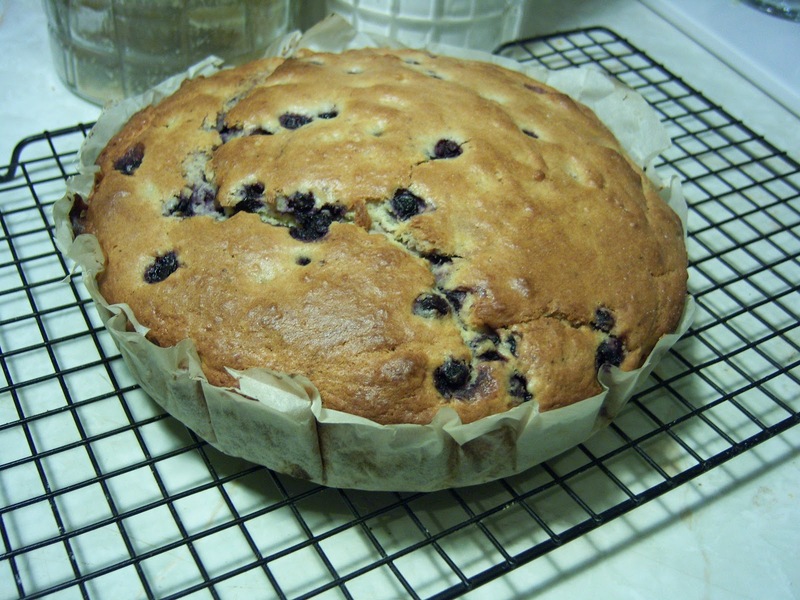 combine the dry ingredients with the egg-cream mixture and fold gently until the are barely incorporated, then add the frozen blueberries and fold a few more times (making sure to scrape the bottom and sides of the bowl) to distribute them in the mixture. over-mixing can result in a tough, dense texture, so avoid that at all cost. divide the mixture between greased or paper-lined muffin/cupcake pans filling each one about 2/3 full, and bake in the top half of the oven until a toothpick inserted into the center of the muffin comes out clean (about 15-25 mins., depending on size). for mini muffins, start keeping a careful eye on them after about 10 mins. once done, allow the muffins to cool in the pan for 10 mins, then remove to a cooling rack. they can be eaten warm or at room temperature, or cooled completely and frozen. a fresh-frozen muffin warmed up in the microwave is almost as good as right out of the oven... if you can keep them around long enough to get to the freezer. no... i am not working on the Guinness record for baked goods largeness. i baked my mega-muffin in a parchment-lined layer pan, and serve it cut into generous wedges. great with tea, coffee, or a glass of season-appropriate fresh lemonade. absurd amounts of joy! slice of moist, crumbly happiness.